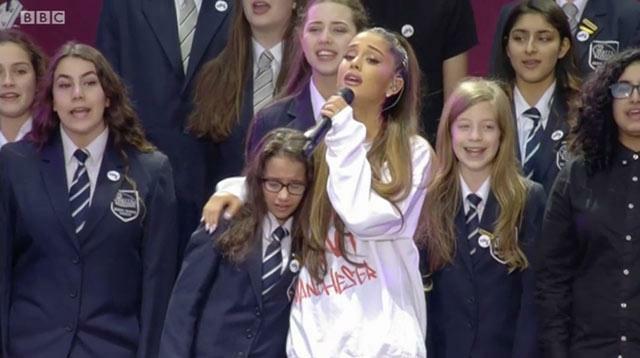 An emotional Ariana Grande was applauded for her strength as she gave her first interview since the Manchester bomb attack. While the singer didn't address the atrocity directly, she welled up as Jimmy Fallon spoke about it towards the end of his interview with the "One Last Time" star. The terrorist attack happened after Ariana's concert at Manchester Arena in May 2017, killing 22 people. Jimmy told the star that he hadn't seen her since that time, and thanked her for returning to the city for the fundraising concert she organized a month after the bombing. "I know it's tough for everybody, tough for fans and tough for you, and I know you haven't done any interviews, and I understand that," the presenter said. "I just wanted to say thank you so much for coming on the show and for being strong and for entertaining and for showing up and going back to Manchester and doing a benefit. "I thought that was awesome of you. I just think you're so strong and so cool." Ariana welled up and replied softly: "Thanks. Thank you." The US host then recited a part of the message which Ariana wrote for fans days after the attack. "We won't let hate win," he read. "Our response to this violence must be to come closer together, to help each other, to love more, to sing louder, and to live more kindly and generously than we did before." Ariana returned to Manchester in June to stage the One Love concert to raise money for the survivors and the families of the victims. The 24-year-old announced on the show that her new album Sweetener will be released in the summer. She added that it's "about bringing light to a situation, or to someone's life, or somebody else who brings light to your life, or sweetening the situation."